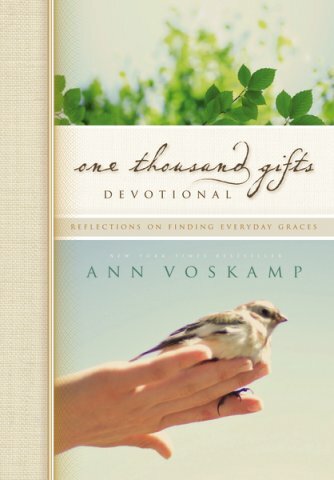 I read Ann Voskamp’s One Thousand Gifts: A Dare to Live Life Fully Right Where You Are, about a year and a half ago. This best seller introduces readers to a word, Eucharisteo and a philosophy of living in light of the grace of God, as it says, right where you are. This idea of giving thanks always and living in the awareness of the brevity and fragility of life with joy is the theme of One Thousand Gifts. It inspired me to start counting along with a whole community of others who were counting their gifts to 1000 and more. When I was contacted about receiving the devotional One Thousand Gifts: Reflections On Finding Every Day Graces, which is based on the book, I was thrilled to have the daily refresher from this humble, much loved author. If you are not familiar with Ann Voskamp’s writing, she shares her child filled, Canadian farmer’s wife life at her blog called A Holy Experience. Considered one of the most influential Christian women of our day, Ann writes about giving thanks in the sometimes harsh realities of daily life. What I love most about this book is that the length of the 60 individual devotional readings are not to short or long but just the right amount. Ann has a writing style that takes a bit of grasping. Tender and beautiful, it can be like catching glimpses of deep truths while gasping for air. She does not always follow straightforward sentence structure, which can leave you feeling, at times inspired and deeply moved, but at other times slightly exasperated! Her heart is poured out on paper and her courage shared is powerful. She shares with a gentle graciousness, and honesty that is hard to describe unless you read her for yourself. These are very much like her blog posts (possibly some portions are from posts?) but edited down to a very manageable daily portion. Each devotion is titled for a different grace: Humble Grace, Dark Grace, Small Grace, Wedded Grace, Standing Grace. As she herself believes, ALL is grace. Each devotional thought ends with a brief, heartfelt prayer, and a few lines for you to add your own thoughts, prayers of graces. The first part of the book is reserved for these devotions but the second half (pages 205-245) are for you to personalize and begin counting “1000 Ways He Loves You…” Included are some quotes and the numbering of 1 to 1000. This makes this devotional/journal a great launching pad for you if you have not started listing your “gifts”, but also makes for a great gift. The book itself is beautifully covered with a bird in hand pictured and includes a pretty blue ribbon to keep your place. A gift for you or a friend. For those who enjoy Ann’s Blog and book already, you won’ be disappointed, but thoroughly blessed with this treasure. This is a lovely devotional. I received a copy of this book through Shelton Interactive in return for a review. Shelton Interactive has offered to give one winner a copy of Ann Voskamp’s book. This would make a wonderful Christmas present, but I just might have to keep it for myself as God has been teaching me so much about gratitude lately. Awesome review. Would love this devo for myself, and then share with my sister. Sweet! You know I love Ann. The devotional would be a nice thing to start the day with. Stacy, please make sure and enter on the Rafflecopter as it is going through that! I see your comment but no entry in the Raffle- let me know if there is a problem , ok? Rafflecopter is new to me! Dawn: I thought I ordered the first book of Ann's. I received the Devotional. I was upset with myself until I looked at the table of contents. She wrote about the different types of grace. My word for this year has been grace. It was a God thing that I ordered the book I received. I love Ann's book and blog!! I will definitely be checking this out!! Thanks for the chance to win!! Hoping to catch up here tomorrow!! Blessings and Hugs!! Ann has been a guest speaker for the last 4 days on Haven. I've enjoyed listening to her and would love to read this devotional.